YANGON—The Kachin State government has decided to shelve a Mongolian company’s proposal to conduct a feasibility study on the extraction of gold and other minerals in Myanmar’s largest national conservation area, a sanctuary nearly triple the size of Singapore in Kachin’s northernmost township, due to serious environmental concerns. The project was proposed by Inner Mongolia Duojin Investment Company Ltd, according to the Kachin State Forest Department. The proposal covers an area of 492,900 acres in Putao Township including Hkakaborazi National Park and its southern extension area, which together form the largest national park in the country, as well as the ASEAN Heritage Park-Hponkan Razi Wildlife Sanctuary, which is home to globally threatened wildlife species including the black musk deer, red panda and white-bellied heron. The area also covers protected forests in the township’s Northern Mountain Forest Complex; these include subtropical evergreen forests, mixed deciduous forests, pine-rhododendron forests and alpine meadows. “How could I allow it?” he said. 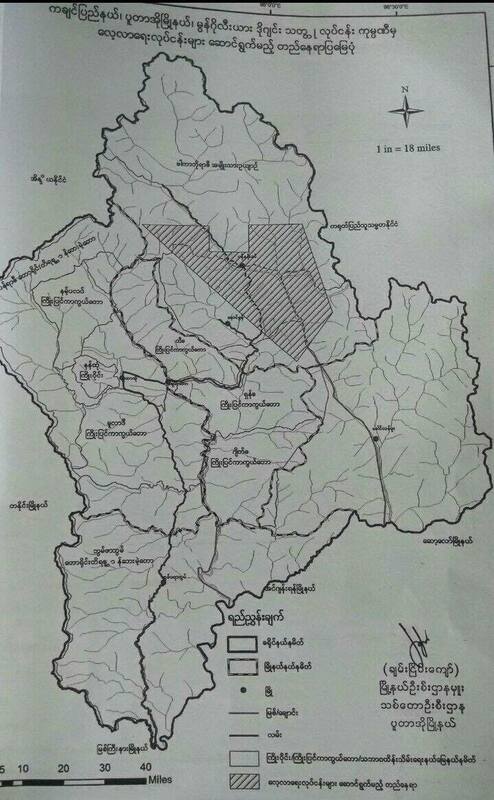 A map of a project proposed by Inner Mongolia Duojin Investment Company Ltd.
Amid a backlash from environmentalist and local residents, the Kachin State cabinet and related departments held a meeting on the issue on Tuesday. At the meeting, the Forest Department submitted a review recommending that the project not be allowed. The state government has not issued an official decision on the matter yet, however. The Forest Department said the team started reviewing the company’s proposal and field study in January. The department decided the areas deserved to be preserved in the interests of coming generations. U Kyaw Kyaw Lwin said the project threatened to harm not only the national conservation areas but also the N’Mai Kha River, which is one of the main sources of the Ayeyarwady River, the lifeline of Myanmar. “The project faces a strong backlash from locals residents. It could easy provoke a conflict between the company and locals. That’s one reason that we decided to scrap the proposal,” he said. Kachin State is rich in natural resources, particular minerals including gold, silver, copper, iron, lead, amber, jade, crystal and coal.